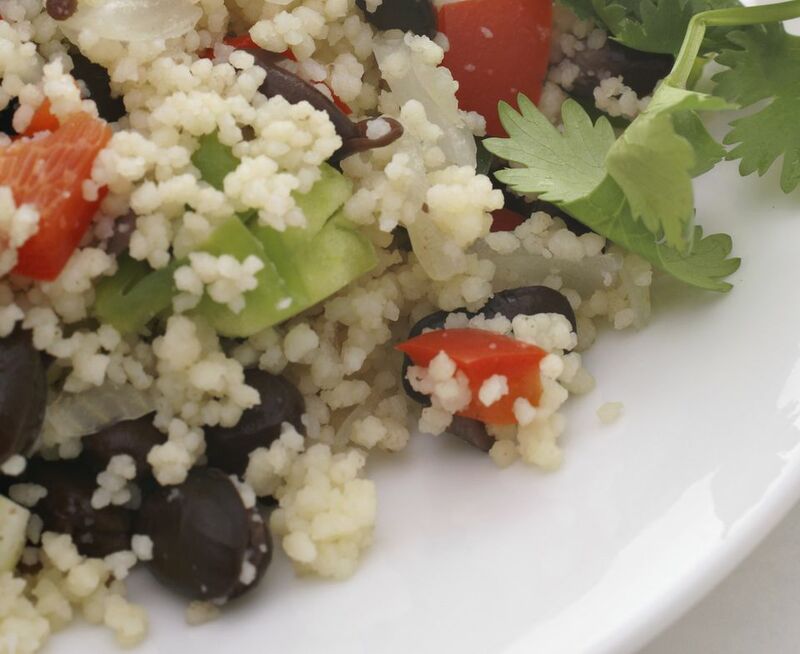 This is a quick and easy recipe for a vegetarian and vegan couscous salad or pilaf with black beans and lots of veggies. Simply toss the couscous with the other ingredients and serve! Use fresh steamed vegetables, canned vegetables or cooked frozen vegetables - whatever you have on hand. Note that this black bean salad or pilaf recipe doesn't have a ton of extra herbs and spices added in, so while you may want to add a dash of chili powder, a seasoning blend such as Mrs. Dash, or even just some garlic salt or seasoning salt, you'll definitely want to use a quality olive oil, and sea salt or kosher salt instead of regular table salt. In the same way, you'll also want to use a good quality vegetable broth or vegetable stock. I nearly always make my own rather than buy a pre-made broth. Not sure how to do that? Here's a simple and basic vegetarian vegetable broth recipe to try. This healthy black bean couscous salad or pilaf recipe is both vegetarian and vegan, but couscous is not gluten-free, so this recipe is not gluten-free. Use quinoa or another gluten-free grain such as millet, kaniwa or teff if you're looking for a gluten-free black bean salad or pilaf recipe. Recipe courtesy of Fantastic Foods. First, prepare your vegetables. Steam your fresh veggies until lightly tender, or, if you're using frozen vegetables, heat them in the microwave according to the package instructions. Next, prepare your couscous. Bring the vegetable broth to a boil in a medium-sized pan on the stove. Once it's boiling, add the couscous, give it a quick stir, cover the pan and turn off the heat. You can also remove the pan from the heat. Let the couscous sit for about 5 - 8 minutes, then remove the lid and fluff the couscous lightly with a fork. Combine all ingredients, stirring to mix well. Serve hot.